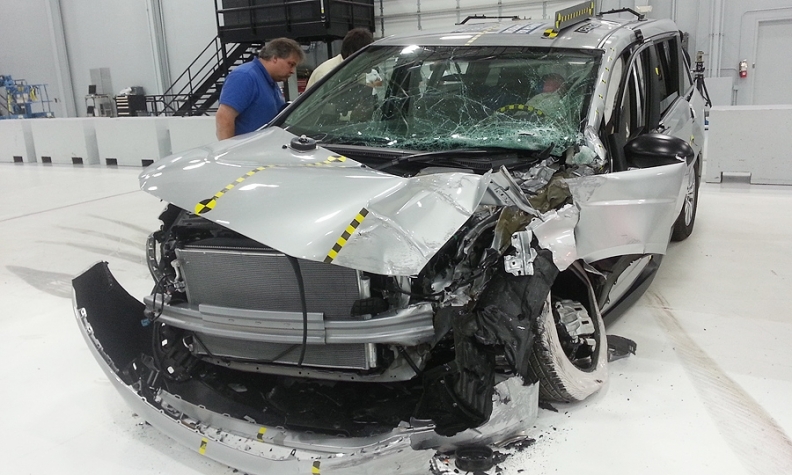 In the IIHS tests, crash energy goes around the steel structures that crumple to cushion the blow of a crash. That much was clear from the Odyssey, which had its driver-side corner crumpled by the force of a crash test at the IIHS laboratory. RUCKERSVILLE, Va. -- The 2014 Honda Odyssey received the top rating on a stringent new crash test from the Insurance Institute for Highway Safety today, giving the updated minivan critical bragging rights with safety-oriented shoppers. With its "good" rating on the so-called small overlap crash test, the Odyssey becomes the only minivan to win Top Safety Pick+ honors from IIHS, which shook up the industry last year when it started ranking vehicles on how well they withstand a crash simulating what happens when the left front corner of a vehicle strikes an object such as an oncoming car, a tree or a pole. The rating is the payoff for a major investment by Honda. The automaker freshened the Odyssey for 2014 with a strengthened steel frame and more robust airbags rather than waiting until the next redesign a few years from now. "Honda's commitment to safety is perhaps best demonstrated by the fact that we achieved this high standard in a midcycle refresh," Art St. Cyr, vice president of product planning and logistics at American Honda Motor Co., said in a statement. Honda now leads all automakers with six models to receive Top Safety Pick+ plaudits. The others are the 2013 Civic sedan and coupe, the 2013 Accord sedan and coupe, the 2013 Acura TL. The company's engineering push began in earnest in 2009, when IIHS released research showing that an outsized number of deaths in car accidents were coming from these small overlap crashes. In these accidents, the crash energy goes around the steel structures that crumple to cushion the blow of a crash. Airbags often do not function as intended. That much was clear from the Odyssey, which had its driver-side corner crumpled by the force of a crash test at the IIHS laboratory here, as Automotive News reported this month. Honda took admirable steps to deal with the shortfalls, said Joe Nolan, vice president for vehicle research at IIHS. "They've addressed those issues," Nolan said during an interview. "They've deployed a really generous side-curtain airbag that will keep the occupant's head from going outside the car. They've resisted intrusion with a really well-designed door frame. "The driver stays centered on the airbag, so the restraint system is keeping him in his seat. All that works together to make the vehicle perform the way it does in any other frontal crash. And that's the holy grail." Some other automakers have struggled, including Honda's archrival, Toyota. The 2013 Camry sedan received a "poor" rating on the test for the 2013 model year, as did the Prius V hybrid and RAV4 crossover. However, the redesigned Scion tC coupe received Top Safety Pick+ honors this month. Toyota also has asked IIHS to test the Corolla, Prius, Highlander and Camry for the 2014 model year -- a sign that the company expects better ratings. Honda, meanwhile, is working on two other safety related initiatives. One is aimed at reducing crashes involving motorcycle riders and the other could help prevent pedestrian accidents. In Detroit Wednesday, Honda engineers demonstrated a driver warning system that uses radio signals called dedicated short range communications, or DSRC. A car with DSRC detects when a pedestrian carrying a DSRC-enabled smartphone is about to enter the roadway. The driver and the pedestrian get two warnings when they get too close to each other, a loud beeping sound and a visual alert via the screen in the vehicle and the smartphone screen. The system designed for motorcycles uses DSRC to alert drivers when a motorcycle is nearby, even if it is out of view. The DSRC system does not automatically apply the brakes or change the vehicle's direction -- only an audible and visual warning. Said Jim Keller, Honda's senior manager for technology research: "The ultimate goal is a collision-free car."